A short stop in downtown Des Moines | Infinite Space. InfiniteTime. When I was young, I enjoyed a certain distinction among my peers which had nothing to do with me and everything to do with my father’s ownership of an 11-story office building downtown in Raleigh, NC, where we lived. Downtown was then the essence of Raleigh, and our building, named the Raleigh Building, was one of the tallest buildings there. It’s now listed on the National Register of Historic Places. My grandfather introduced me to the Raleigh Building when I carried a baby bottle. We’d ride the bus that wound through the core of downtown Raleigh, past service stations, diners and the mom-and-pop stores on Hillsborough Street. Just before the handsome Greek revival State Capitol, the bus headed south, and a block later we were on Hargett Street where our building stood, right next to the 10-story Odd Fellows Building. 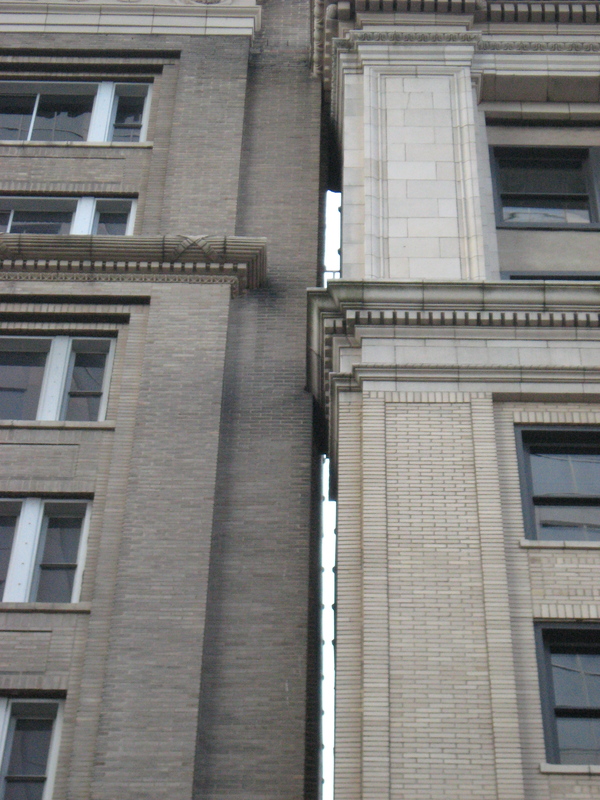 The two buildings are so close together that, if you were to slip off our roof into the gap between them, you’d probably be stuck there for eternity. That’s what I thought—and acutely felt—every time I looked up at that gap. I still wonder how the brick masons managed to build the side of second building after the first one was built. When I was a wee bit older, my grandfather had retired, my father was the owner/manager, and the Raleigh Building was a playground for me and my friends. We held elevator races (there were two), shouted to each other from floor to floor through the old-fashioned Cutler mail chute (it had openings on every floor), and sometimes we’d go up to the roof and yell down at people on the sidewalk (I’m lucky to be alive today). When I was older still, old enough that my father recognized some of my abilities, managing the Raleigh Building became my job. With a couple of employees, we did just about all the maintenance and renovation ourselves. We built walls, hung drywall, installed dropped ceilings, commercial vinyl wallcovering, chair rail and crown moulding. We changed countless fluorescent lamps. One job my father didn’t insist we do was repairing the elevators. That was smart: the elevators were demons, cantankerous beyond redemption. My father would have lived 10 more years had they behaved themselves. Today a modern building with a glass and metal skin shadows the Raleigh Building. The newer structure has little charm of its own: it just reflects the surroundings. But the juxtaposition turns the Raleigh Building into a jewel that has style, grace and that long-gone edge of fine architectural detail. Its windows do what windows should. They can be opened and closed (try to find that in a modern office tower) and they reveal rather than hide the people at work inside. An ornamental half-round concrete bar just above the ninth floor breaks up the visual mass. At the very top an overhanging concrete coping with upper and lower dentils greets the heavens with a handsome flourish. What good is a skyscraper that fails to pay homage to the sky? After my father died, the Raleigh Building went to a court-ordered auction, the outcome of a dispute among the owners. I dropped all the years, labor, and emotion I’d invested in that building. I figured I’d paid those dues until I visited Des Moines, Iowa. I thought Des Moines was a Midwestern version of US-style urban sprawl until I spied a magical sight: the ornamented tops of the old high-rises downtown. Talk about gravity…they pulled me like a tide into their towering realm. These Titanics of the urban skyline unleashed memories of my father, my grandfather, and the Raleigh Building. Downtown Des Moines’ towers are numerous and fascinating. Their lobbies are dressed in Italian marble, their elevator portals cast in the finest brass. Any of them would fit perfectly in Manhattan or Chicago. 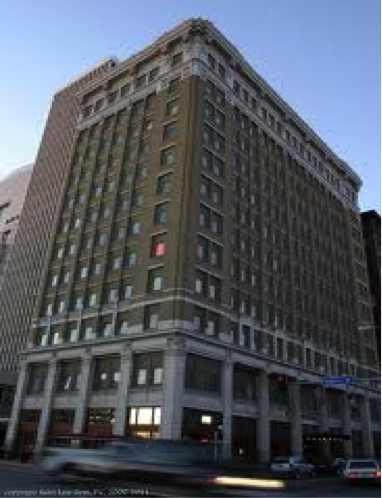 The 12-story Hippee Building (now the Midland Building) at 206 6thAvenue made headlines in the July 20, 1913 December issue of the Des Moines Register and Leader as Iowa’s tallest skyscraper. The Hippee building could “…truly (be) called an absolutely fireproof structure.” During construction in winter, fire was allowed to burn unguarded on floors where freshly applied plaster could have been ruined by freezing temperatures. Today, a funky carpet covers the marble lobby floor. The little bits of exposed marble I saw made me want to rip that carpet out right then and there; the Hippee Building, like all these older towers, has some hidden jewels. Nearby, on the corner of Sixth and Walnut stands an absolute gem, an elegant early 1930s five-story renovated for US Bank. My uneducated hunch is that it was plucked right from Italy, and, indeed, “simplified Italian Renaissance” is what the display in the lobby declares. 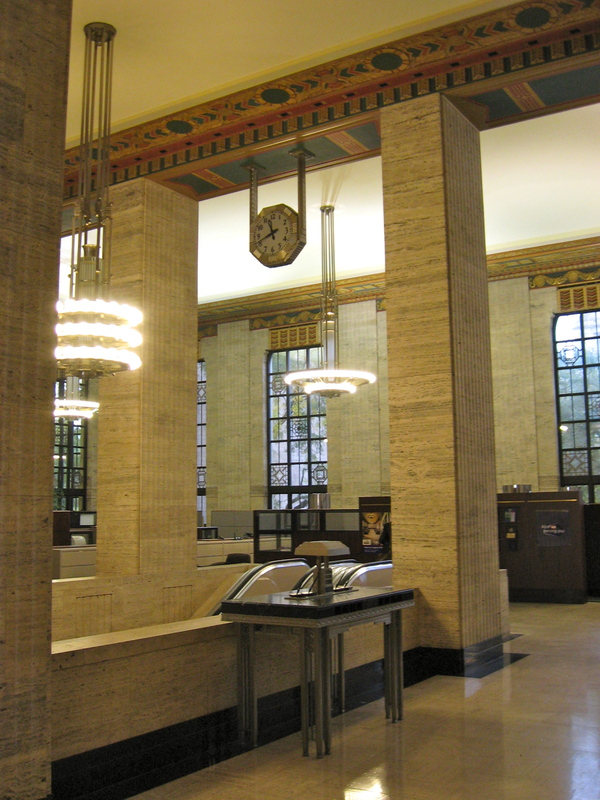 The interior is an art deco masterpiece. It has all the right stuff: the deco light fixtures, onyx marble service desks, a ceiling Michelangelo would have loved, and an elevator lobby that oozes silence with its walls of subtle olive-hued marble and deep red elevator doors trimmed in lacquered brass. 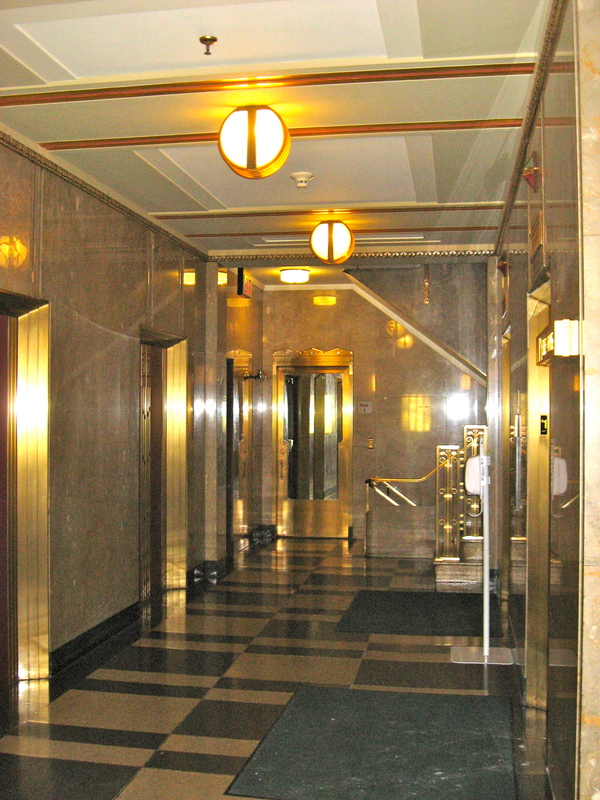 The indicator lamps above each elevator could be jewels in a monarch’s crown. The effect is reverential, a place to pause deeply while you await your lift. 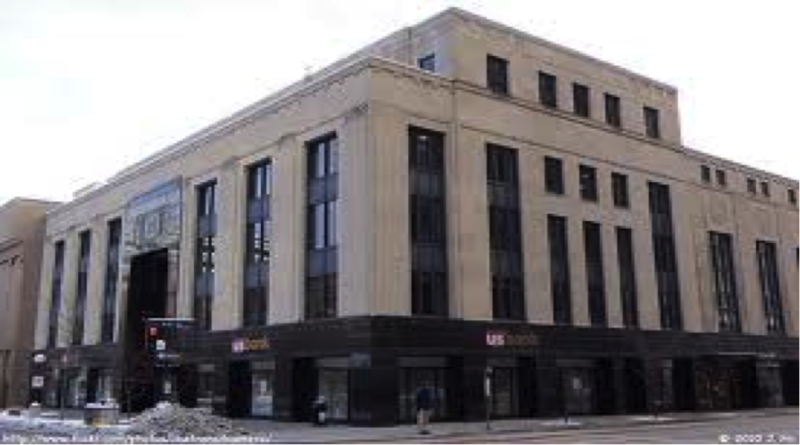 At 604 Locust Street stands the 19-story Equitable Building. The guard at the lobby desk tells me tenants are moving to the suburbs. He deflects my questions by pointing toward the building entrance. 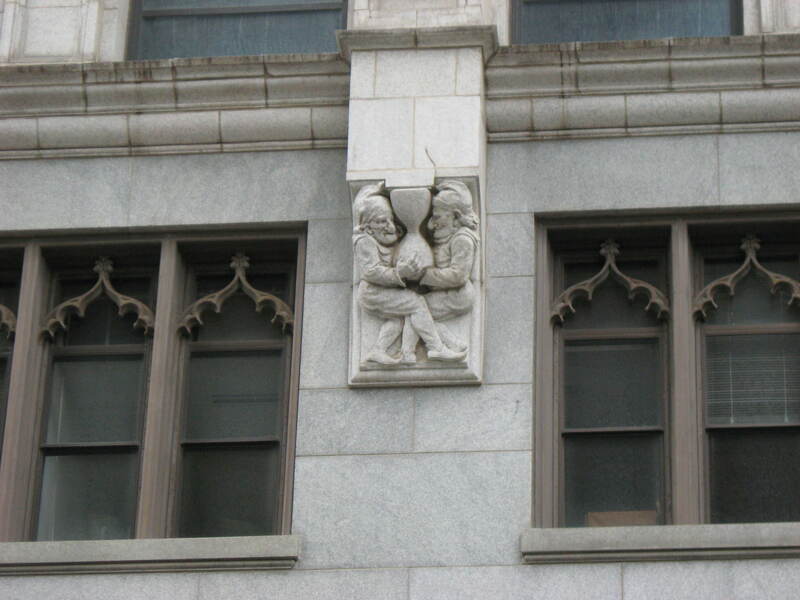 There a plaque at the entrance tells the tale of the Equitable from the depths of its foundation ground to the very top. The story begins with 1492 submerged concrete piles. They uphold 3400 tons of steel and 1.5 million bricks and a weighty assortment of wires, cables, glass, porcelain, and all manner of other stuff. This baby has eight of my all-time favorite elevators, the Westinghouse Selectomatic Mark IVs, which glide up and down as if they’re bathed in oil, rocking ever so soothingly from side to side. During the ride to the top, I felt as content as an infant in a cradle rocked by his mother’s own hand. Just before the doors open at the top floor, the machinery stops to catch its breath for a pregnant moment, as if to indicate that something grand awaits. But the doors open to reveal only a dank, forlorn hallway all too common among these older towers. Such a pity. And in the lobby, one of the elevators was stone cold dead, its doors open, the cab as dark as a cave. It looked like it hadn’t moved in years, the high-rise world’s equivalent of a sunken ship. In 2005, a developer planned to upfit some floors of the building into upscale apartments, but the building fell into foreclosure. It’s still on the market. Back in the lobby of the Equitable, the guard has gone, and the workers have begun their exodus home through the dense downtown air. I head to the very modern Science Center of Iowa, where there’s no marble, no brass, no art deco delights, no style at all. Everything’s very clean, modern, no-nonsense, with little to catch the eye. What a difference a few years make. Entire buildings were once art. Now, art typically hangs on a wall or sits atop a pedestal, if it’s present at all. In the film “City Hall”, Al Pacino as John Pappas, the embattled mayor of New York, has a wonderful bit of dialogue that means the world to me and defines the film. He mentions and quotes Pericles, the mayor of Athens: “The first and perhaps only great mayor was Greek. He was Pericles of Athens, and he lived some 2500 years ago, and he said, ‘All things good on this Earth flow into the City, because of the City’s greatness.’” I believe cities are among man’s greatest creations, remarkable in ways far too numerous to count. As the early evening sun punches through the clouds below, I depart Des Moines, wondering about the fate of all that beautiful marble in those fabulous towers. My guess is that here in Iowa, time will not forget its habit of moving in circles, and those fabled high-rises may live to see a new day, when life flows into them once again. This entry was posted in Architecture, City Center, Family, Humor, Iowa, NC, Work. Bookmark the permalink.